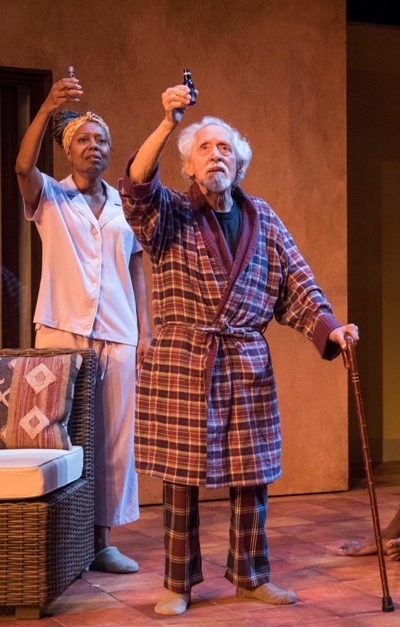 Actor Mike Nussbaum will turn 95 in December (no, that is not a typo), and he is now delivering such a towering performance in the Northlight Theatre production of Rachel Bonds’ play, “Curve of Departure,” that you might easily be persuaded he is simply a supremely talented actor impersonating an old man. Rudy (Nussbaum), in decline but full of zest, can be sharp as a tack. Watch him as he nails every comic line, every emotional outburst, every slide into panic and disorientation, every heartbreaking confessional speech, every fleet exit from bed to bathroom as a bout of incontinence strikes, and you will see a master class in acting. Take note of how he projects his voice, and makes every word completely audible in the most natural way (something many actors fail to do.) Or simply watch the way in which he so convincingly sleeps, although of course he is alert to every cue. 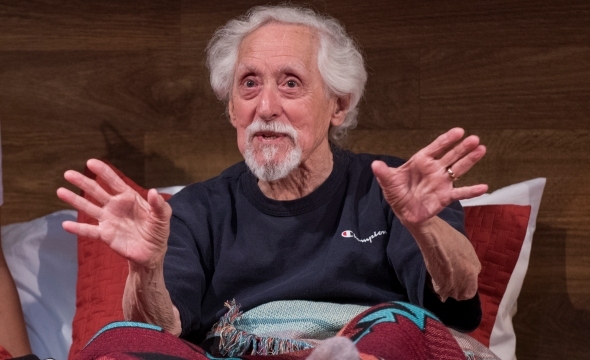 Nussbaum is said to be “the oldest working Equity stage actor,” but it would be more fitting to say that he is an ageless theatrical phenomenon who unfailingly brings a special light and energy to every role he plays. Without question, “Curve of Departure” – the title was inspired by a line in a poem by Pulitzer Prize winner Sharon Olds – is a sensational vehicle for Nussbaum. And while the play can often seem more artificially devised than organic, Bond has homed in on some profound questions about the relationships between parents and children, the intense animosities that can develop within extended families, and that thorniest of all matters – how to end life at the moment of one’s own choosing. The story unfolds in a rather drab hotel room near an airport in Santa Fe, N.M. Already settled in are Rudy (Nussbaum), and his devoted daughter-in-law and caretaker, Linda (Penelope Walker in a beautifully nuanced turn), who works as a teacher. The two are on an emotionally difficult mission as they are planning to attend the funeral of Cyrus – Rudy’s long-estranged son and Linda’s ex-husband. Years earlier Cyrus walked out on Linda and their son Felix, and started another family. Arriving to share their room are Felix, who is none too happy about the whole thing, and his boyfriend Jackson, who senses it is the right thing to do. Nussbaum, Penelope Walker, Danny Martinez and Sean Parris play an extended family at a funeral gathering: Aged Rudy, his daughter-in-law Linda, her son Jackson, and his boyfriend Felix. A few additional facts need to be mentioned here, although they are not specifically discussed in the play, but clearly exist in the subtext. 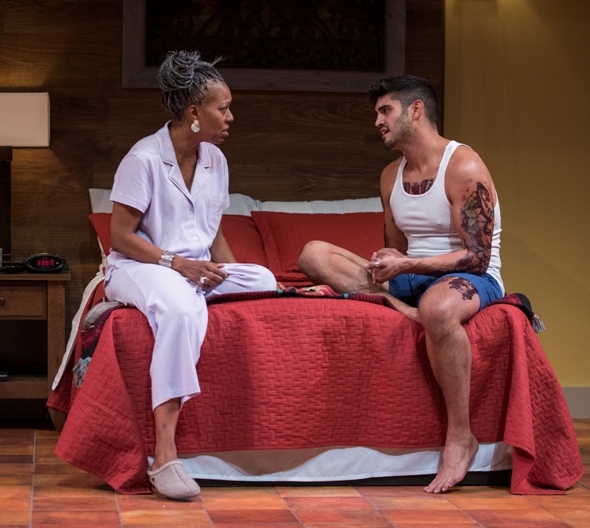 Linda is African American, and her gay son, who has embarked on a solid if not yet lucrative career as a businessman, is involved with a Latino man from a troubled family who has too many tattoos for Rudy’s taste, and is not quite of the status Linda (who early on struggled to come to terms with her son’s sexual orientation) had envisioned for him. Valedictory: In the end, it’s all about love (and love and love.). Meanwhile, after considerable probing, Jackson opens up about his own dilemma – trying to gain custody of his very troubled sister’s young daughter, even if he lacks the financial resources to hire the lawyers necessary, and even if it puts his relationship with Felix in jeopardy. There are big choices to be made, as Felix (played by Sean Parris with just the right sense of emotional and pragmatic wariness) clashes with Jackson (Danny Martinez, ideal as a sweet if somewhat hapless soul clearly ruled by his heart and his desire to save a young life), over the wisdom of his plan. 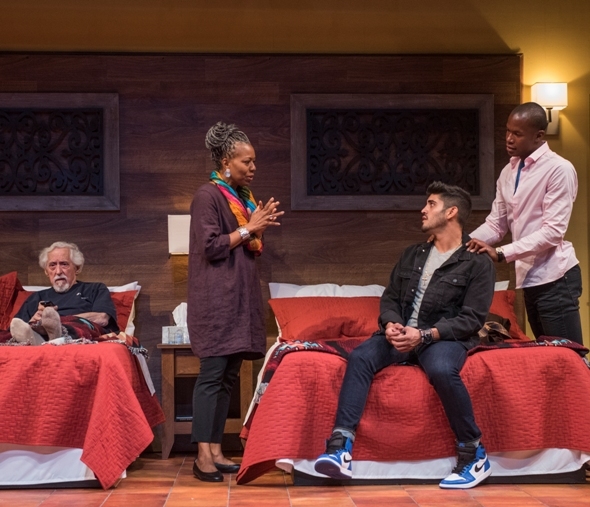 Under the tightly orchestrated direction of BJ Jones, and with a design team that includes Lauren Negri (sets), Alexis Cheney (costumes), Heather Gilbert (lights) and Andre Pluess (whose brief musical interludes strike just the right chord), the play’s clunkier elements are mostly finessed. 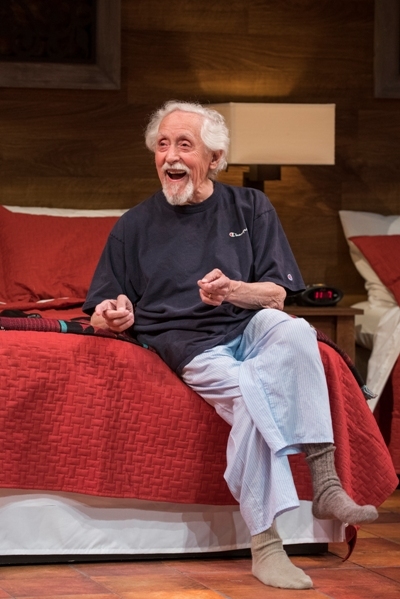 And Nussbaum’s memorably delivered “valedictory” message about love (and love and love), and about the necessity of making bold choices and big sacrifices in its name, is reason enough to see this play. Linda (Penelope Walker) and Jackson (Danny Martinez) contemplate their own big choices.